At Inductive Automation our customers can't say enough good things about our technical support team. A friendly staff, a responsive development team and an active public forum are some of the reasons our clients rave about us. We get calls from Ignition users all over the country every day. Here is Dennis Runo’s story. 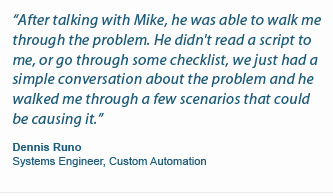 Dennis, a systems integrator with Custom Automation, recently called Inductive Automation's support line and spoke with support specialist, Mike. "I called up Mike at tech support because we were having an issue with one of our customers' redundant servers. The redundant server was not connecting properly so we were getting connection errors. "After talking with Mike he was able to walk me through the problem. He didn't read a script to me, or go through some checklist, we just had a simple conversation about the problem and he walked me through a few scenarios that could be causing it. "After a few minutes we discovered the source of the problem. A setting with one of the network cards was causing the connection error. After we discovered that, it was a simple fix. Mike helped me get up and running while we were still on the phone together; it only took a few minutes. "I really appreciate the fact that the support team members at Inductive Automation don’t have big egos. They never make me feel like I'm talking to a ‘know-it-all’. They never make me feel dumb for asking a question, even if it is a simple fix. They are also not afraid to admit when they don't have the answer. When they don't know how to fix something they talk to the development team and then quickly call me back with a solution. "There is also a great forum that I'm active on; I often find the answers to my questions there before I ever need to call. When I do call they are always really friendly, and I never feel like they are trying to rush me off the phone. I know them all on a first-name basis, and they know me. That makes it a lot easier to find solutions to problems because they already have a good idea of what I know and the kind of issues I have to deal with. "Mike helped me get to the root of the problem I was having, and I'm confident that he will be able to help me again in the future."